I found a picnic table on Craig's list. I love love love finding good deals. This table is like new and was $10! The kids are loving it. I take it in and out of the house. 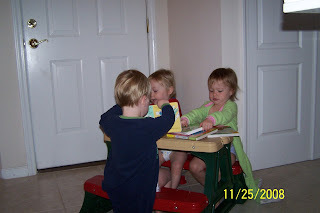 They read their books, eat, and climb on the table. It's a hit! I did not take many pictures on Thanksgiving day! Not sure how that happened. 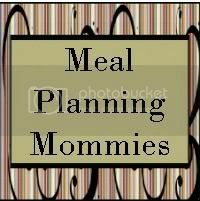 I guess I got too busy with preparing the feast. 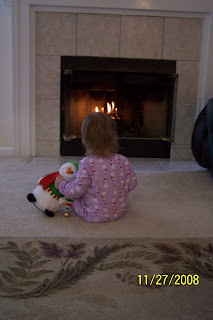 Here is Sophia enjoying the fire on Thanksgiving day - which fell on my momma's birthday. It was nice to have my parents over for the holiday! Here are Tristan and Sophia enjoying the tree. There is nothing like a real tree! I decided to decorate the tree as usual with the exception of hanging the most valuable ornaments out of reach! The kids have been exceptional. 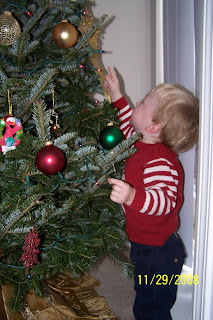 I allow them to touch or kiss the ornaments but they can not remove them from the tree. There have been a few times where the ornaments mysteriously land in their hands. 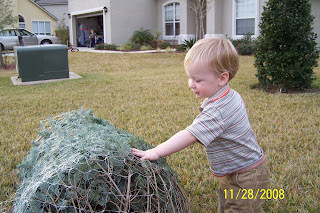 There have also been times where the kids whack the tree with an object (as if it is okay since they are not technically touching the tree). The needles are falling faster than years without kids since they love to walk by the tree or lean in to kiss their ornaments. 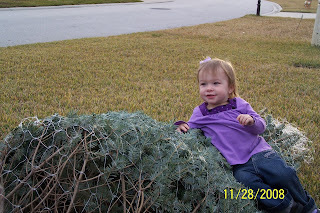 Savannah did not want to pose with the tree because she was too busy in the van pretending to drive. 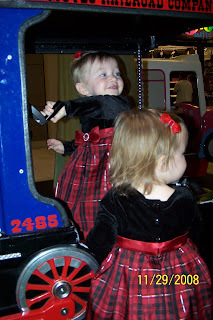 Here is Sophia and Savannah playing at the mall after our visit with Santa. 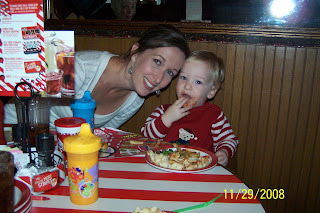 And here we are at TGIFriday's after Santa! The decorated tree and the temptation! You can see the Elmo ornament. That is Savannah's second Christmas keepsake. She loves it and yells Elmo every time she spots him! Too cute! 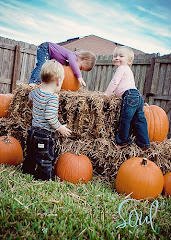 They are getting so big!